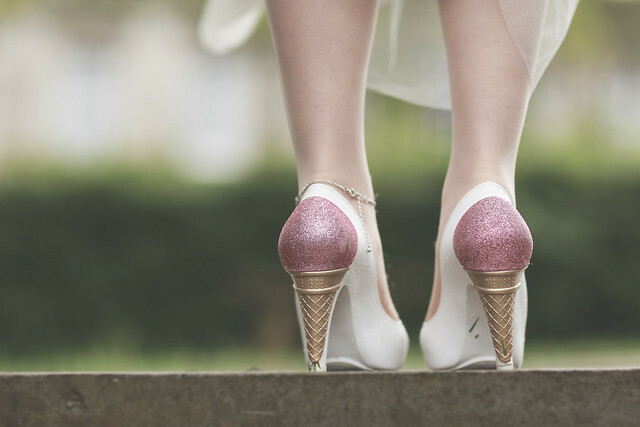 - I had found my dream Ice Cream shoes! Scouring the Internet one day I spotted a photograph of a celebrity wearing these shoes (the black version) and instantly knew they had to be mine! After months of stalking and hoping, Gemma gave me the ultimate tip off when they hit ASOS. The moment they arrived I was smitten. I have never been a ‘shoegal’ (like my heroes Carrie Bradshaw and Alex and Char), but this shoe changed my life! The fact I wore them on my wedding day obviously gives them royalty status among my shoddy counterparts. But also the fact I only get them out on V.Special occasions (like seeing Lady Gaga last night Live.) And the way I carefully and precisely pack them away in their allocated dust bag and shoe box, means I have finally found my one shoe love. I love this sort of quirky shoe and these are fab and the perfect wedding shoe. Aww, they're so cute!! I sort of regret never getting a pair! I love how glittery and feminine these shoes are. These are so lovely and unusual too!